May has been a really long month. Working in schools there are seasons that always seem more difficult than other times of the year. May has been one of those months with a number of times that I have sooooo wanted to go to bed rather than my usual routine of painting at the end of the day. Nevertheless, I sat myself down to create. With 516 consecutive days of daily creations, one thing (of many) that I have learned is when I'm feeling less motivated to create is usually the time I need the meditative and reflective space the most that my daily creative process offers. Here's a peek into some of my daily creations during the month of May. 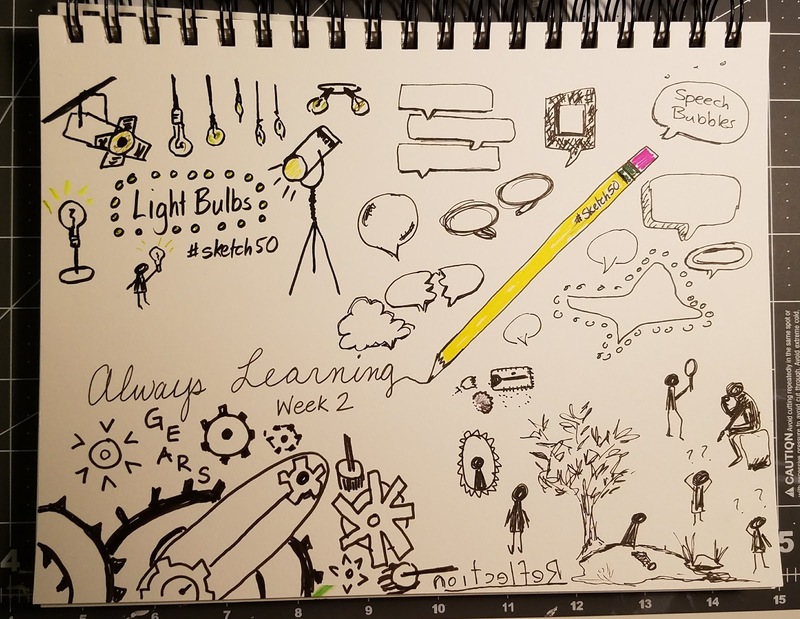 The month began with a continuation of #Sketch 50 2.0. I abandoned this challenge after four weeks. It wasn't bringing me the same joy as my painting. I enjoyed capturing the process but never figured out the lighting of my captures. I did like the challenge of creating a small piece of an overall composition focused on a single theme each day only to see a scene emerge after five consecutive days. One thing I did continue throughout the month was attending different SketchWalks offered at the Apple Store. I feel like a groupie at times with my continued attendance but its such a great opportunity to learn from others who have such great experience and different perspectives. It also has made me more comfortable sketching in public, an exercise I practiced at a recent, lengthy School Board Meeting. And these SketchWalks are 100% free! As long as the Apple Store continues to offer these, I plan on attending as my schedule allows to improve my digital sketching skills. The other benefits of the Sketch Walks are that I continue to learn more about the ins and outs of the ProCreate app but also some new sketching exercises. One of my favorites is a quick sketch. This involves giving yourself a minute or two by actually setting a timer and sketching a scene. This eliminates any chance to change your brush, get exactly the right color and my personal nemesis, the undo button. Instead, the focus becomes capturing the essence of what you see. You can always go back and edit. How often do we self-edit ourselves before committing to our ideas on paper? This exercise helps prevent that impulse. Another fun exercise is a continuous line drawing. I have done this as a blind contour exercise which means you only look at the object you're drawing using a continuous line and avoid looking at your paper. A continuous line drawing is a similar concept but your eyes can go back and forth as you draw something without lifting your pen using a continuous line. I was pleased with the initial results of this scene looking down on the first floor of the mall. I did lose my line in a couple places due to the side menu or accidentally running off the screen. If you try this on your iPad within ProCreate, I highly recommend changing the snap tool under settings so your lines don't snap automatically straight on you. Most of the month was spent on animals using Goauche. I LOVE the look of gouache but I have not mastered the use of gouache. 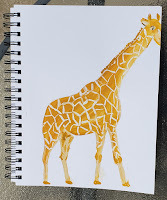 I also haven't mastered the proportions of animals as seen by my half-face giraffe. It was either sacrifice the length of the neck or the face. I chose to keep the distinguishing characteristic. 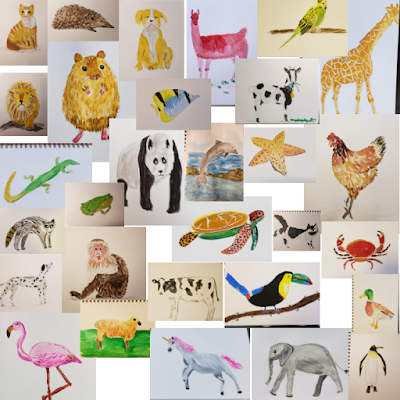 It was fun to sketch different animals using a photo reference and then mix and apply paint. Overall, I am pleased with the results of 31 Animals over the month of May. What will June hold? 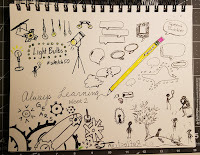 CreativeBug is offering a daily challenge on Mixed Media that I may give a try. I've been spending time in one of my other journals working on drawing faces by trying to emulate different styles as I try to uncover my own. Integrating this with different mixed media techniques could be interested. Or, if I come across a good watercolor daily challenge I may give that a go as well. 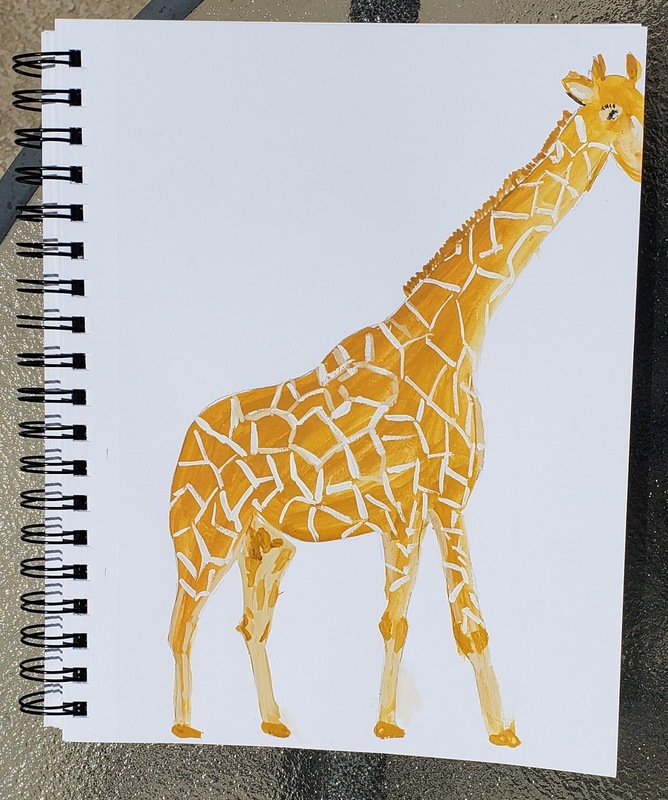 I do look forward to doing more outdoor sketches through the summer and during some of my planned travels later this month.